The Inca Empire depended on a road system, called the Qhapaq Ñan, that linked its four regions from Ecuador to Chile, moving armies, laborers and food. Like beads on a necklace, the Qhapaq Ñan was studded with grain silos, called qollqas, where food could be stored. The largest set of these qollqas is at Cotapachi, near Cochabamba in Bolivia, 1000 km from the ancient Inca capital of Cusco, Peru. Between 1450 AD and 1500 AD, the Inca Empire built 2500 granaries at Cotapachi, on a dry ridge overlooking a small lake in the Cochabamba Valley. 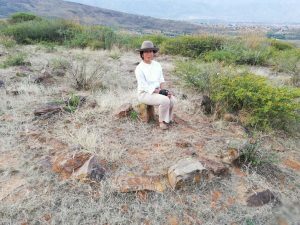 According to David Pereira, archaeologist and expert on the qollqas, this site was part of a vast complex, with about 1500 more qollqas on other, nearby hilltops. Each qollqa is about 2.5 meters in diameter at its stone base and could hold perhaps 4 tons of maize. They were originally about 3 meters tall, with gently tapered cylindrical walls woven from the stems of the ch’illka plant and plastered with mud and roofed with straw of the needle grass. In 2007, 27 of the qollqas of Cotapachi were reconstructed, so to speak. They were designed by the architect Jorge Obando Stemberg and built by soldiers from the nearby Tumusla Regiment of the Bolivian Army. These replicas are made from adobe (mud) bricks, but they are kind of graceful in the afternoon sunlight, with the backdrop of the mountains. Nothing is left of the other silos, except for rows and rows of stone bases. From Cusco, the Inca could command the granary silos to be filled with maize grown in the green, irrigated fields of Cochabamba. The grain was carried to the garrison that guarded the southeast frontier at Inka Llajta, or it was sent to Cusco via the administrative settlement of Paria, in Oruro, Bolivia. A royal army passing through Cochabamba could provision its soldiers directly with the grain stored in the silos. The grain was transported on llamas, which thrive on native Andean vegetation, but their slender backs can only carry a light pack of some 25 kg. You would need 160 llamas to haul the grain from one silo. It must have been a marvelous sight when thousands of pack llamas flowed like a river, up the stone slope to Inka Raqay, their first stop on the way to Cusco. Like the Inka, all ancient states were built on the food and labor wrested from farmers. Some of the arrangements for commandeering and transporting that grain were as impressive as the cities they fed. The bases of grain silos may be humbler than ruined palaces, but it’s important to recognize that civilization is based on agriculture, and that farming does leave its mark on the archaeological record. 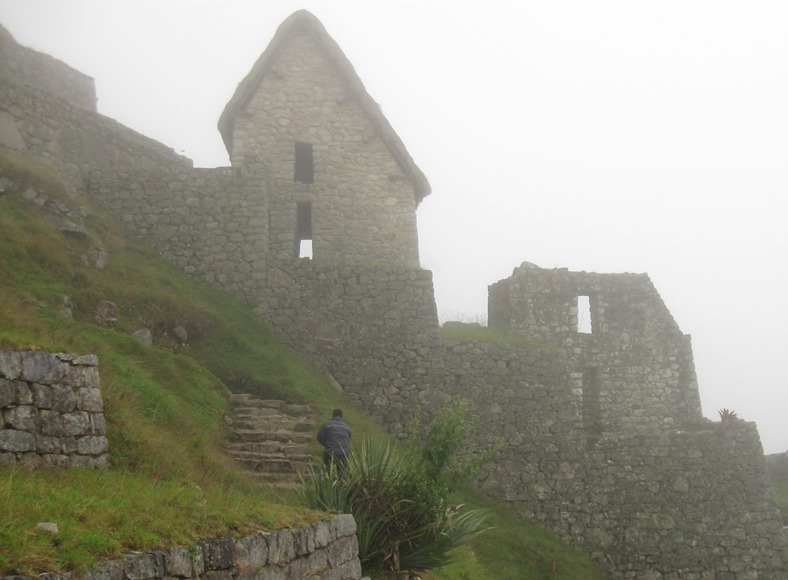 Thanks to David Pereira for sharing his insights about the Inca grain silos at Cotapachi. The “-s” ending from Spanish is used today for Quechua plurals. In classical Quechua the qollqas would have been called “qollqakuna”. The Inca, or Inka, was the supreme ruler of a state that was called “Tawantinsuyu,” meaning “all four quarters”. There were actually more qollqas in the Mantaro Valley, in Peru, than in the Cochabamba Valley, but the silos in Mantaro were spread out over several sites. Needle grass includes Stipa ichu and related species. It is called paja brava in Spanish, and ichhu in Quechua. Eeckhout, Peter 2012 “Inca Storage and Accounting Facilities at Pachacamac.” Andean Past 10(1):12. El Imperio Incaico dependía de un sistema de caminos, llamado el Qhapaq Ñan, que unía sus cuatro regiones desde Ecuador hasta Chile, moviendo ejércitos, trabajadores y alimentos. Como cuentas en un collar, el Qhapaq Ñan estaba tachonado de silos de grano, llamados qollqas, donde se podían almacenar los alimentos. El conjunto más grande de estas qollqas está en Cotapachi, cerca de Cochabamba en Bolivia, a 1000 km de la antigua capital incaica de Cusco, Perú. Entre 1450 y 1500 AD, el Imperio Incaico construyó 2.500 graneros en Cotapachi, en una cresta seca con vista a un pequeño lago en el Valle de Cochabamba. Según David Pereira, arqueólogo y experto en las qollqas, este sitio formaba parte de un vasto complejo, con cerca de 1500 qollqas más en las otras cimas cercanas. Cada qollqa medía unos 2,5 metros de diámetro en su base de piedra y podría almacenar unas 4 toneladas de maíz. Originalmente tenían unos 3 metros de altura, con paredes cilíndricas suavemente cónicas tejidas a partir de los tallos de la planta ch’illka y estucados con barro y techadas con paja brava. En el 2007, 27 de los qollqas de Cotapachi fueron reconstruidos. Fueron diseñados por el arquitecto Jorge Obando Stemberg y construidos por soldados del cercano Regimiento de Tumusla del Ejército Boliviano. Estas réplicas están hechas de adobes, pero son elegantes a la luz de la tarde, con el fondo de la cordillera. No queda nada de los otros silos, excepto filas y filas de bases de piedra. Desde Cusco, los incas podían ordenar que los silos se llenaran de maíz cultivado en los verdes campos irrigados de Cochabamba. El grano fue llevado a la guarnición que vigilaba la frontera sureste en Inka Llajta, o fue enviado a Cusco a través del asentamiento administrativo de Paria, en Oruro, Bolivia. Un ejército real que pasaba por Cochabamba podía abastecer directamente a sus soldados con el grano almacenado en los silos. El grano fue transportado en llamas, que prosperan en la vegetación nativa andina, pero sus esbeltos lomos sólo pueden llevar una mochila ligera de unos 25 kg. Se necesitarían 160 llamas para llevar el grano de un silo. Habrá sido una vista todo un espectáculo ver a los miles de llamas cuando fluyeron como un río, por la ladera de piedra hasta Inka Raqay, su primera parada en el camino a Cusco. Al igual que el Inka, todos los estados antiguos fueron construidos sobre los alimentos y la mano de obra arrebatada a los agricultores. Algunos de los arreglos para requisar y transportar ese grano eran tan impresionantes como las ciudades a las que alimentaban. Las bases de los silos de granos pueden ser más humildes que los palacios en ruinas, pero es importante reconocer que la civilización se basa en la agricultura, y que la agricultura deja su huella en el registro arqueológico. Gracias David Pereira por compartir sus ideas sobre las qollqas de Cotapachi. El sufijo “-s” del español se usa hoy en día para plurales en quechua. En el quechua clásico las qollqas se habrán llamado “qollqakuna”. El Inca, o Inka, era el gobernante supremo de un estado que se llamaba “Tawantinsuyu”, que significa “los cuatro cuartos”. Hay más qollqas en el Valle de Mantaro, en el Perú, que en el Valle de Cochabamba Valley, pero los silos en Mantaro estaban dispersos en varios sitios. La paja brava incluye Stipa ichu y especies relacionadas. Se llama ichhu en quechua y needle grass en inglés. Early states from Mesopotamia to Mesoamerica still inspire awe with their fine art and architecture. Yet the artists and soldiers who built the states needed to be fed; whatever their other accomplishments, early states were always based on agriculture. In a recent book, James Scott reminds us that early states usually collected their taxes as grain, staple crops grown on a large scale, such as maize, rice, and wheat, which are easy to store. Scott observes that there were no ancient states based on potatoes or other tuber crops. Yet he admits that the Inka were a partial exception. The Inka did have maize, but they depended largely on the potato which is bulky and perishable, making it difficult to collect and store. This set me thinking. Inspired by Professor Scott’s excellent book, I’d like to explain how tuber crops, and the potato in particular, sustained the Inka state and provided taxes. 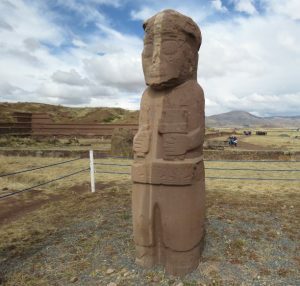 First, the Inka state (called Tawantinsuyu) was not an early state, but had co-opted the myths and king lists of a much earlier one, Tiwanaku, which managed an empire that straddled the Andes from the Pacific Coast to the warm valleys of the Amazon Basin. Tiwanaku began as a village (about 1580 BC), but was a state by 133 AD and an empire by 724, lasting until 1187 when it collapsed in a civil war and broke up into smaller chieftainships (señoríos) that were independent until they were later conquered by the Inka. The capital city of Tiwanaku was built near Lake Titicaca, on the high plains of Bolivia, not far from the border of modern-day Peru. It once housed 100,000 residents and was centered on large stone buildings made of sandstone and andesite, a hard rock quarried in Peru and ferried across Lake Titicaca on ships woven from the reeds that grew in the shallow waters. Tiwanaku was created long before the first Inka, Pachacuti, organized Tawantinsuyu in Cusco starting in 1438. So the Inka’s Tawantinsuyu was a late state, patterned on the much earlier and long-lasting Empire of Tiwanaku. But in the pre-Colombian Andes, states could collect taxes in potatoes because of an ingenious method of making them light-weight and non-perishable. The Inka and the people of Tiwanaku both knew how to freeze dry potatoes during the winter nights of the high Andes. This preserved potato is called chuño: there are two types, a grey one and a white one, called tunta, which is soaked in water during processing. Both types are as hard and dry as wood. With the water removed, the potato loses weight and can be stored for years. Potatoes were portable once they were transformed into chuño. The Inka taxed their subjects in chuño, as well as maize. Both of these foods were kept in royal storehouses. Chuño was simply soaked in water and boiled to make them edible. The Inka Empire was large and complex, eventually spanning most of the Andes, from Ecuador to northern Argentina. Like Old World states, the Inka collected taxies in grain: maize in this case. But unlike other classic civilizations, the Inka and an earlier state, Tiwanaku were also largely sustained by a perishable tuber crop, thanks to ingenious recipes for preserving the potato as chuño. The modern cities of Peru and Bolivia have kept few vestiges of the ancient states that preceded them. But you can still buy chuño in Andean markets and even at upscale supermarkets. The ancient states are gone. Their art works are now curiosities in museums, yet the crops the Inka grew and their imaginative methods of preserving and serving food are still very much alive. Finucane, Brian Clifton 2009 “Maize and Sociopolitical Complexity in the Ayacucho Valley, Peru.” Current Anthropology 50(4):533-545. Haas, Jonathan & Winifred Creamer 2006 “Crucible of Andean Civilization: The Peruvian Coast from 3000 to 1800 BC.” Current Anthropology 47(5):745-775. Horkheimer, Hans  2004 Alimentación y Obtención de Alimentos en el Perú Prehispánico. Lima: Instituto Nacional de Cultura. Segunda edición. Montaño Durán, Patricia 2016 El Imperio de Tiwanaku. Tercera Edición. Cochabamba: Grupo Editorial Kipus. 249 pp. 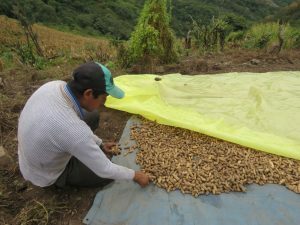 Fundación Valles, an NGO in Bolivia that does agricultural research and development, has developed a peanut dryer that uses sunlight to help prevent groundnuts from developing the molds that produce deadly aflatoxins. The prototype model had an A-shaped metal frame, raised off the ground, and was covered in a special type of light yellow plastic sheeting known as agrofilm, able to withstand long exposure to sunshine. The dryer kept out water, and with air flowing in from the ends of the dryer, the peanuts could dry even on rainy days. Two years ago, in Chuquisaca Fundación Valles worked with farmers to develop cheaper versions of the dryer, making the A-shaped frames from wooden poles, instead of metal, and began distributing large sheets of agrofilm, 2 by 12-meters, for which farmers paid $14, half the original cost. Fundación Valles encouraged the farmers to continue adapting the original design of the dryer. In May 2018 I visited some of these farmers together with agronomists Walter Fuentes and Rolando Rejas of Fundación Valles, to find out what had happened. 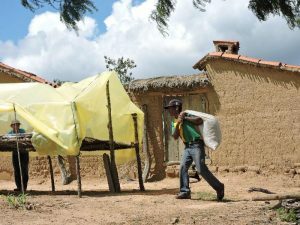 When Augusto Cuba, in Achiras, received the agrofilm from Fundación Valles in 2016, he did not put it to immediate use. The weather was dry during several harvests, but during the rainy days during the peanut harvest in May, 2018, don Augusto put the agrofilm to the test. He took a plastic tarp to his field and laid it on the ground. He covered it with freshly harvested groundnuts, cut the agrofilm in half, and then placed the six meter length on top. Don Augusto ignored the basic design of the dryer. He didn’t want to go to all of the trouble of cutting poles and building the raised platform of wooden poles. His design was much simpler and portable: as he worked in the field he could remove the agrofilm when the sun came out, and put it back when it started to drizzle again. The main disadvantage, however, was that the air did not flow over the covered nuts; humidity could build up, allowing mold to develop. The original tent-like dryer has several limitations. It is expensive, and as don Augusto pointed out to us, it is a lot of work to make one from wood. At harvest, peanuts are heavy with moisture. The pods lose about half their weight when dried. So farmers dry their peanuts in the field, and sleep there for several nights to protect the harvest from hungry animals. A solar dryer must be carried to the field, yet these may be up to an hours’ walk from home and involve climbing up and down steep slopes. Farmers who are using the original solar dryer, as designed by Fundación Valles, are those who have their fields close to home. Yet even taking a simple tarp to the harvesting site would be an improvement over drying the pods on the bare ground. Later I had a chance to discuss don Augusto’s method for drying peanuts with Miguel Florido, an agronomist with Fundación Valles, and with Mario Arázola, the leader of APROMANI (a peanut farmers’ association). 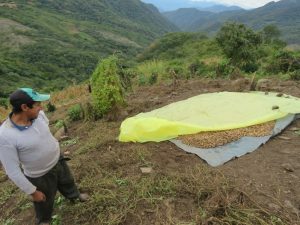 They were concerned that don Augusto´s design would trap in too much moisture, especially if it was misty all day and the farmer never had a chance to remove the agrofilm. We agreed that a dryer had to have a few simple agronomic criteria; it had to keep out the rain, keep the groundnuts off the ground, and let air flow through. After discussing don Augusto’s case, we agreed that a dryer also has to meet some of the farmers’ criteria: it has to be cheap, portable and able to handle large volumes of peanuts, while keeping them out of the rain. Aflatoxin contamination is a serious problem worldwide, and while it can be addressed, inventing a simple technology is hard work. Researchers start with a problem and some ideas to solve it, like air flow and keeping peanuts dry. But it is only after offering farmers a prototype that researchers can see the farmers’ demands. For example, designing a stationary dryer helps researchers to see that farmers need a portable one. Making and using a small dryer in the field highlights the need for a larger one. These types of demands only emerge over time, as in having a long, slow conversation, but one that is worth having. Fundación Valles, una ONG en Bolivia dedicada a la investigación y el desarrollo agrícola, ha desarrollado un secador de maní que usa la luz solar para ayudar a evitar que los maníes (cacahuates) desarrollen los mohos que producen aflatoxinas mortales. El modelo prototipo tenía un armazón de metal en forma de A, levantado del suelo, y estaba cubierto con un tipo especial de lámina de plástico amarillo claro conocida como agrofilm, capaz de soportar la exposición prolongada al sol. El secador no dejaba pasar el agua, y con el aire que entraba desde los extremos del secador, los maníes podrían secarse hasta en días lluviosos. Hace dos años, en Chuquisaca, la Fundación Valles trabajó con los agricultores para desarrollar versiones más baratas del secador, haciendo los marcos en forma de A de postes de madera, en lugar de metal, y comenzó a distribuir grandes láminas de agrofilm, de 2 por 12 metros, para lo cual los agricultores pagaban $14, la mitad del costo original. La Fundación Valles alentó a los agricultores a seguir adaptando el diseño original del secador. En mayo de 2018 visité a algunos de estos agricultores junto con los agrónomos Walter Fuentes y Rolando Rejas de la Fundación Valles, para averiguar qué había pasado. Cuando Augusto Cuba, en Achiras, recibió el agrofilm de la Fundación Valles en 2016, no lo puso en uso de una vez. No hacía falta porque hacía sol durante varias cosechas, pero cuando los días lluviosos durante la cosecha de maní en mayo del 2018, don Augusto puso a prueba el agrofilm. Él llevó una lona de plástico a su parcela y la puso en el suelo. Lo cubrió con maní recién cosechado, cortó el agrofilm por la mitad y lo colocó sobre su cosecha. Don Augusto no copió el diseño básico del secador. No quería tomarse la molestia de cortar postes y construir la plataforma elevada de postes de madera. Su diseño era mucho más simple y portátil: mientras trabajaba en el campo, podía quitar el agrofilm cuando salía el sol y volver a colocarlo cuando comenzaba a lloviznar nuevamente. La principal desventaja, sin embargo, era que el aire no fluía sobre el maní cubierto; la humedad podría acumularse, posiblemente permitiendo que se forme el moho. El secador original en forma de carpa tiene varias limitaciones. Es caro, y como nos señaló don Augusto, es mucho trabajo hacer uno con madera. En la cosecha, los maníes son pesados con la humedad. Las vainas pierden más o menos la mitad de su peso en el secado. Entonces los agricultores secan su maní en el campo y duermen allí varias noches para proteger la cosecha de los animales hambrientos. Un secador solar debe llevarse al campo, aunque puede tardar hasta una hora a pie desde su casa e implica subir y bajar pendientes fuertes. Los agricultores que sí usan el secador solar original, tal como lo diseñó Fundación Valles, son aquellos que tienen sus campos cerca de la casa. Sin embargo, incluso llevar una lona simple al sitio de cosecha sería mejor que secar las vainas sobre el puro suelo. Más tarde tuve la oportunidad de discutir el secador de don Augusto con Miguel Florido, un agrónomo de la Fundación Valles, y con Mario Arázola, el líder de APROMANI (una asociación de agricultores de maní). Les preocupaba que el diseño de don Augusto atrapara demasiada humedad, especialmente si estaba nublado todo el día y el agricultor no podía quitar el agrofilm. Acordamos que un secador debía tener unos pocos criterios agronómicos simples; debía proteger el producto de la lluvia, evitar contacto entre el suelo y los maníes y dejar que el aire fluyera. Después de discutir el caso de don Augusto, acordamos que un secador también debe cumplir con algunos de los criterios de los agricultores: tiene que ser barato, portátil y capaz de manejar grandes cantidades de maní, mientras los mantiene fuera de la lluvia. La contaminación por aflatoxinas es un problema serio en todo el mundo, y aunque se puede solucionar, inventar una tecnología simple es un trabajo duro. Los investigadores comienzan con un problema y algunas ideas para resolverlo, como el flujo de aire y el maní seco. Pero es solo después de ofrecer a los agricultores un prototipo que los investigadores pueden ver las demandas de los agricultores. Por ejemplo, diseñar un secador estacionario ayuda a los investigadores a ver que los agricultores necesitan uno portátil. Hacer y usar un pequeño secador en el campo resalta la necesidad de un más grande. Este tipo de demandas solo surgen con el tiempo, como en una conversación larga y lenta, pero que vale la pena tener. Rosario Cadima is an enterprising farmer who spends two days a week buying and selling potatoes at the fair in Colomi, Cochabamba. Juan Almanza, the talented extensionist we met in last week’s blog (Videos for added inspiration), had given her a DVD with a series of agricultural learning videos aimed at farmers like her. The DVD included seven videos in Spanish, Quechua and Aymara on caring for the soil. One of the videos was about peanuts (groundnuts), which like other legumes, fixes nitrogen for the soil. Rosario recently watched the DVD with her parents, grandfather and other family members. They watched all of the videos over three nights, and she recalled them vividly. Juan was surprised when Rosario mentioned the video on groundnuts. “But you don’t grow groundnuts here,” he said. “No, but we buy them and eat them,” Rosario said. Then she explained that she and her family sometimes bought peanuts that had a thick mold on them; they would simply wipe it off and eat the apparently clean nuts. “So did we,” Juan admitted. The mold is a fungus, and it releases a poison called aflatoxin into peanuts and other stored foods. The video showed all of this, and explained that people should bury moldy food, instead of eating it. Rosario’s family is now careful to avoid eating moldy peanuts. Farmers are also consumers and a video can help them to make better food choices. Smallholder farmers don’t always have opportunities to learn about public health matters related to the food that they produce and eat. The farmer learning videos hosted on Access Agriculture are now carrying many more messages than we first imagined. And the videos are rich enough that viewers can interpret them to learn unexpected lessons. As we have said in our earlier blog (Potato marmalade), eating is the last step in a process that usually starts with planting a seed, so it makes sense that videos for farmers can also benefit consumers. The video Managing aflatoxins in groundnuts during drying and storage is available to watch or freely download in English, Spanish and a dozen other languages. Rosario Cadima es una AGRICULTORA emprendedora que pasa dos días a la semana comprando y vendiendo papas en la feria de Colomi, Cochabamba. Juan Almanza, el extensionista talentoso que conocimos en el blog de la semana pasada (Videos para un poco más de inspiración), le había dado un DVD con una serie de videos de aprendizaje agrícola dirigidos a agricultores como ella. El DVD incluyó siete videos en español, quechua y aymara sobre el cuidado del suelo. Uno de los videos era sobre cacahuates (maníes), que al igual que otras leguminosas, fija nitrógeno para el suelo. Rosario recientemente vio el DVD con sus papás, abuelo y otros miembros de la familia. Miraron todos los videos durante tres noches, y ella los recordó vívidamente. Juan se sorprendió cuando Rosario mencionó el video sobre maní. “Pero aquí no se produce maní”, dijo. “No, pero los compramos y los comemos”, dijo Rosario. Luego explicó que ella y su familia a veces compraban maníes que tenían un molde grueso; simplemente lo limpiaban y comían los granos, que parecían limpios. El moho es un hongo y libera un veneno llamado aflatoxina en los maníes y otros alimentos almacenados. El video mostró todo esto, y explicó que las personas deben enterrar el maní con moho, en vez de comerlo. La familia de Rosario ahora tiene cuidado de no comer maníes con moho. Los agricultores también son consumidores y un video puede ayudarlos a tomar mejores decisiones para con su comida. Los pequeños agricultores no siempre tienen la oportunidad de aprender sobre asuntos de salud pública relacionados con los alimentos que producen y comen. Los videos de aprendizaje agrícola ubicados en Access Agriculture ahora llevan muchos más mensajes de lo que imaginábamos al inicio. Y los videos son lo suficientemente ricos como para que el público pueda interpretarlos para aprender lecciones inesperadas. Como hemos dicho en nuestro blog anterior (Mermelada de papa), comer es el último paso en un proceso que generalmente comienza con la siembra de una semilla, por lo que tiene sentido que los videos para agricultores también puedan beneficiar a los consumidores. El video El manejo de aflatoxinas en maní está disponible para ver o bajar gratis en inglés, español y una docena de otros idiomas. The American anthropologist Mary Weismantel notes that for peasant farmers in the Ecuadorian Andes, cooking is the very last step (before eating) in the long process of growing crops. During my career I’ve met many agricultural scientists working on better ways to grow more food on small farms, to harvest it more efficiently and lose less in storage. Until recently, I had met few who studied better ways of cooking. 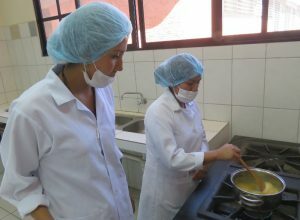 At UMSS, a public university in Bolivia, food technologist, Prof. Jenny Espinoza, and her students are designing new products from potato. 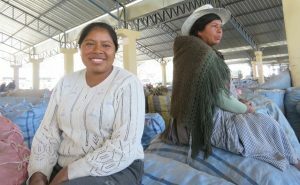 They hope that these products will increase the demand for potatoes and raise prices that Bolivian smallholders receive. 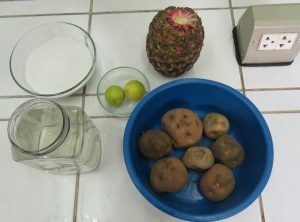 One student has discovered that unique colors of natural dye can be derived from the various native varieties of Andean potatoes. Another has made pasta from potato flour. Last week I had a chance to see thesis students Marizel Rojas and Dubeiza Flores making potato marmalade in the food laboratory. Strictly speaking, marmalade is made from oranges, but in South America most jams are called “mermelada.” As with all inventions, such as the lightbulb or metal plow, creating a new food product involves trial and error, with the inventor slowly working towards the target concept. Marizel and Dubeiza got some suggestions for marmalade from the internet. These weren’t much help, but they were a start. The potato is a good source of pectin, the glue that holds the jam together, but the original recipes produced a lumpy, tasteless paste. Eventually the researchers figured out how much sugar to add, and they learned that fruit had to be added to add more flavor than a plain potato could offer. They also realized that the potato had to be puréed in an electronic blender. The student researchers learned that the total amount of sugar had to equal 80% of the combined volume of potatoes and fruit, after boiling off most of the water. Then these amounts had to be converted into simple measures that cooks could use without doing any arithmetic. 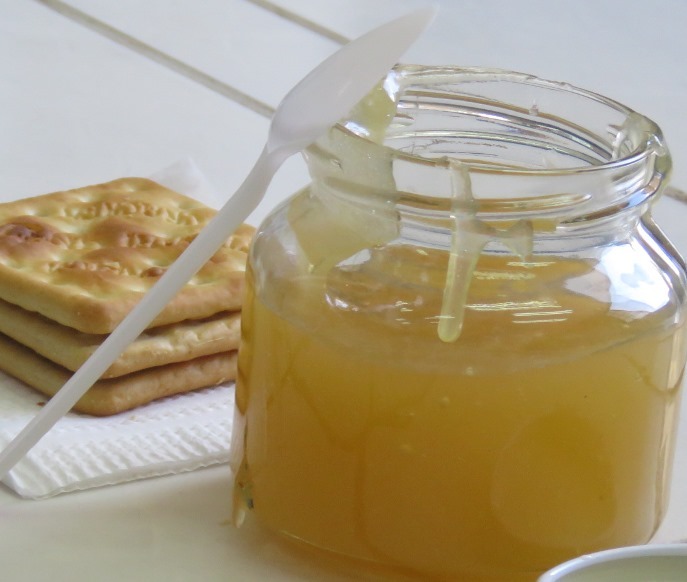 After watching the thesis students make the jam, we sat down with some of the other faculty and students and ate a whole jar of it on crackers (biscuits). It was delicious, especially when warm, with no taste of potato. Agricultural inventions often go through several stages. The researcher develops a prototype which farmers validate, and modify, which can then be shared with other communities. They then continue to creatively adapt the idea. The potato marmalade is still at the prototype stage, but it has come a long way. The students have started to make their products with a farm community in Piusilla, Morochata, near Cochabamba. Only time will tell if potato marmalade becomes popular with consumers, but the research has shown a bit more of the potential hidden in the versatile potato. The trials have been a training ground for two young food engineers. If you can make marmalade from potatoes no doubt many more things can be made from the humble tuber. We recently wrote about Bolivian farmers who are marketing value added products. Makes enough marmalade to fill about 3 jars. Peel the potatoes, wash them and cut them into cubes. They should make about 2 cups when cubed, or 100 grams. Boil the potatoes until they are cooked. Purée the mashed potatoes in an electric blender with a cup of water, which makes the potatoes easier to blend. Peel the pineapple, cut it into cubes. Purée it in the blender. It should be about 2 cups or 100 grams of fruit. Add the pineapple purée to the potato. Add just 1 cup of sugar. (Don’t add all 3 cups now, or the marmalade will turn brown). Return the mix to the stovetop and boil for about 15 minutes, stirring constantly. Boil until the mixture is thick. As you boil off the water, the mix should lose about half of its volume. Add the other 2 cups of sugar and cook for about 5 minutes until the mixture is thick. Remove from the fire and pour the hot marmalade into sterile glass jars. Put the lid on the jars and turn the jars upside down to cool. Turning the jars upside down sterilizes the inner side of the lid with the boiling hot marmalade. La antropóloga estadounidense Mary Weismantel señala que para los campesinos de los Andes ecuatorianos, cocinar es el último paso (antes de comer) en un largo proceso que empieza con la siembra. A través de los años, he conocido a muchos científicos agrícolas que tratan de mejorar el cultivo de alimentos en fincas campesinas, cosechar de manera más eficiente y perder menos en pos-cosecha. Pero hasta hace poco, conocía a pocos que estudiaban mejores formas de cocinar. En la UMSS, una universidad pública en Bolivia, la tecnóloga de alimentos, la Prof. Jenny Espinoza, y sus estudiantes están diseñando nuevos productos de papa. Esperan que estos productos aumenten la demanda de la papa y que suban los precios que reciben los campesinos bolivianos. Una tesista ha descubierto que se pueden derivar colores únicos de las diversas variedades nativas de papas andinas. Otra ha hecho pasta de harina de papa. Marizel y Dubeiza recibieron algunas sugerencias de mermelada de Internet. Estos no fueron de mucha ayuda, pero fueron un comienzo. La papa es una buena fuente de pectina, el pegamento que aglutina la mermelada, pero las recetas originales produjeron una pasta grumosa e insípida. Finalmente, las investigadoras calcularon que cantidad de azúcar agregar, y aprendieron que había que agregar fruta para dar más sabor del que podría ofrecer una papa común. También se dieron cuenta de que la papa tenía que ser hacerse puré en una licuadora. Las tesistas aprendieron que la cantidad total de azúcar tenía que ser igual al 80% del volumen combinado de la papa y la fruta, después de perder la mayor parte del agua durante la cocción. Luego estas cantidades tuvieron que convertirse en medidas simples que las cocineras podrían usar sin hacer cálculos matemáticos. Después de hacer la mermelada, nos sentamos con algunos de los otros profesores y estudiantes y comimos un frasco completo con galletas. Fue deliciosa, especialmente por ser caliente. No tenía ningún sabor a papa. Los inventos agrícolas a menudo pasan por varias etapas. La investigadora desarrolla un prototipo que las agricultoras validan y modifican, que luego se puede compartir con otras comunidades. Luego continúan adaptando creativamente la idea. La mermelada de papa todavía está en la etapa de prototipo, pero ha recorrido un largo camino. 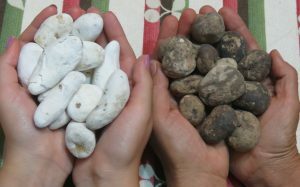 Las tesistas han comenzado a hacer sus productos con la comunidad agrícola de Piusilla, Morochata, cerca de Cochabamba. Solo el tiempo dirá si la mermelada de papa se vuelve popular entre los consumidores, pero la investigación ha mostrado un poco más del potencial escondido en la versátil papa. Las pruebas han sido un campo de entrenamiento para dos jóvenes ingenieras de alimentos. Si se puede hacer mermelada de la papa, sin duda, se pueden hacer muchas más cosas a partir del humilde tubérculo. Hace poco escribimos sobre agricultores bolivianos que venden productos de valor agregado. Hace suficiente mermelada para llenar alrededor de 3 frascos. Pele las papas, lávelas y córtelas en cubos. Debe ser unas 2 tazas cuando están en cubos, o 100 gramos. Hervir las papas hasta que estén cocidas. Haga el puré de papas en una licuadora eléctrica con una taza de agua, para que las papas sean más fáciles de mezclar. Pele la piña, córtela en cubos, haciendo un puré en la licuadora. Es aproximadamente 2 tazas o 100 gramos de fruta. Agregue el puré de piña a la papa. Agregue solo 1 taza de azúcar. (No agregue las 3 tazas ahora, o la mermelada se pondrá marrón). Regrese la mezcla a la estufa y hierva durante más o menos 15 minutos, revolviendo constantemente. Hierva hasta que la mezcla esté espesa. Al hervirse, la mezcla debería perder aproximadamente la mitad de su volumen. Agregue las otras 2 tazas de azúcar y cocine por unos 5 minutos hasta que la mezcla esté espesa. Agregue el jugo de limón. Retire del fuego y vierta la mermelada caliente en frascos de vidrio estériles. Pon la tapa sobre los frascos y ponga los frascos boca abajo mientras se enfríen. Así se esteriliza la parte interior de la tapa con la mermelada hirviendo.